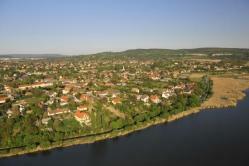 Biatorbágy is located in the northern part of Pest county, in the area bordering Fejér county. It is neighboured in the north by Páty and Budakeszi, in the east by Budaörs and Törökbálint, in the south-east by Sóskút, in the south by Etyek in Fejér county, and in the west by Herceghalom. The inner area of the town is located in the Zsámbék Basin, it is surrounded by the Buda Hills in the NW-SE direction, its eastern part extends into the Budaörs Basin. Area: 4379 hectares, residential area: 496 hectares, population: on 1st January 2013 12908 people, the downward trend seen from 1985 turned in 1991. Most of the employees work locally, though the number of those commuting to Budapest is still considerable, and the number of those working in the neighbouring towns (Budaörs, Törökbálint, etc.) has increased. Most of the small and medium sized enterprises operate in the residential area, among them several plants producing packaging materials, transport agents, companies providing retail and catering, computer-related and other services. Due to the favourable transport conditions and the large-scale public utility construction implemented in our village between 1990 and 1994, a commercial-transport-industrial zone has developed and is growing fast on the northern edge of the village. In the first years of the new millennium significant residential development also started along the motorway and railway line connecting Austria and Northern-Transdanubia with Budapest. Both parent villages have street-type centres, only the oldest part of Bia shows the characteristics of clustering. The newly built parts show the characteristics of a garden suburb. There is a zone of small gardens on the vineyard hills surrounding the town, which according to the intentions of the owners has a holiday area character. There is a considerable forest on the area of the town extending to Tétény-Sóskút Plateau, on the rest of the areas there is large-scale farming, although on some hundreds of hectares there are smaller farms as well, as a result of the „compensation” procedure. By resolution No. 127/2007 (29th June) of Dr. László Sólyom, president of Hungary, Biatorbágy was granted town status as of 1st July 2007. According to the act on municipalities, a village may apply for town status, if „town status is justified by its level of development, its role in the region”. From the criteria the balanced economy, the network of public utilities, the low rate of unemployment, the system of institutions providing basic care, the active cultural and sports life, the developed civil society and town planning, or last but not least the town-like appearance counted for much. Let this page help everyone living in Biatorbágy to learn more about our hometown and to take better care our guests, let it help all visitors to learn about everything nice and good in Biatorbágy; let it contribute to the further development of our manifold human relationships.